Around fifty per cent of heat produced by underfloor heating can be absorbed by concrete slab. 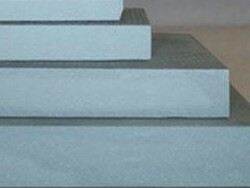 Marmox underfloor insulation, therefore, provides the ideal solution to compliment underfloor heating systems. Marmox construction boards are used to insulate heated flooring systems and remain concealed underneath the finished flooring. The boards are light weight and easy to install. The innovative design of the boards allows for application in wet areas such as spa bath frames. Can be used in wet area application. For more information about the Marmox Australia product range please visit the website.